In this DIY interior decorating snippet I’ll tell you a bit about movement. Movement or flow in interior decorating describes how the eye is drawn to different elements in your overall decorating scheme. There are two main ways to create movement in decorating. The first is by depicting actual movement - for example, a painting of horses running on a beach. The other way is to lead the eye using line, pattern and colour. In order for your DIY interior decorating to have a sense of movement you need to ensure that all the elements that serve to draw the eye have equal value. Let me put that another way, let’s say you have a collection of plates on either side of a chimney breast. If the plates on the one side are bigger or darker they become a focal point - your eye does not jump between them to create movement. They need to be of equal importance to the eye for that feeling of flow to be there. Why should I create movement in my decorating? Movement can make your interiors more interesting because your eye is always attracted to something else. Think of when you’re browsing in a decor store and you find that you just love that lamp, and that rug, and that vase, and that table; you just keep on finding more things you love as your eye is drawn through the displays. If you don’t have a natural focal point in your room, using movement can help to establish the focal point you have chosen. Creating a visual flow in your decor gives a room a feeling of fullness. The viewer feels like they just haven’t taken everything in, and they need to look at the decor again. You can also create an atmosphere and evoke feelings of excitement by creating movement in your interior decorating. Create movement with colour: Notice how your eye cycles through all the red items from the pictures to the bed to the seat and then is drawn up again by following the bed posts. See how the red used has the same tone. Create movement using similar elements: We’ve got the circles of the plates and the circles of the table, but note that colour has been used as well for additional visual flow. 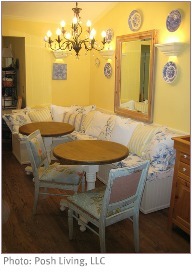 The blue in the plates matches the blue in the cushions and the wooden table echoes the mirror’s wooden frame. The wall sconces also add to the visual flow. 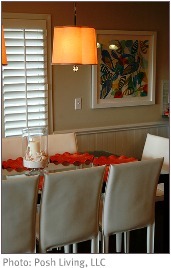 Create movement with texture: Start with those lovely frilly orange placemats, then jump to the detailed print with hints of orange, then onto the apricot toned lamps, then back again to the collection of shells. Texture can capture attention because it is more visually interesting than the surroundings. 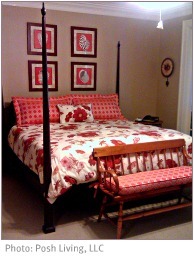 Create movement with line or pattern: I love this one! 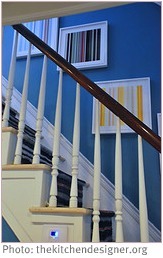 There are pictures of horizontal lines that correspond to the lined stair runner. There are also framed lines in a different colour that keep things interesting. The banisters contribute to the line pattern as well. 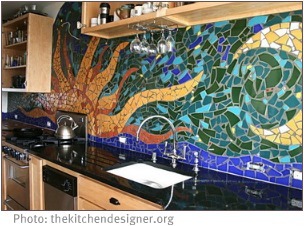 Create movement with a mural: Your eye follows the sun’s tendril-like rays as they branch out along the kitchen walls. 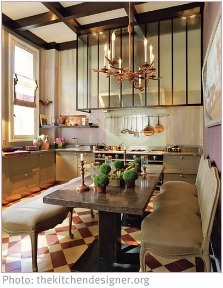 Create movement with details: Lots of competing details are responsible for drawing your attention in this kitchen. Strong vertical lines above the cooker hood, a collection of copper pots, a copper chandelier and the diamond pattern on the floor all vie for the viewer. Thinking of getting stuck into some DIY decorating now? Well, lets get moving!